"Holiday at Lake Bodom (15 Years of Wasted Youth)" is a new "CD+DVD career retrospective" - in other words its a greatest hits package from Finnish metal band Children of Bodom. 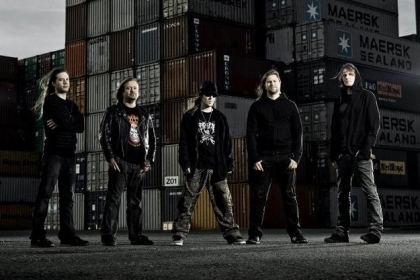 It's hard to believe but its true - Children of Bodom have been with us for fifteen years. The band took their name from the infamous unsolved 'Lake Bodom Murders', which took place in Finland in 1960, and the album title is a clear reference to this. "15 Years of Wasted Youth is the sound of Children Of Bodom working hard, partying hard, being relentless and stubborn," says the band's superstar guitarist / vocalist Alexi Laiho. "We went through many brick walls to get to where we are, and after seven studio albums, two live albums, non-stop touring, bleeding and breaking a lot of bones, I think we are justified in putting this album out. Let the music speak for itself. You have been warned." The release features songs from each of the bands seven studio albums as well as two newly-recorded cover songs. The DVD portion of the package will include "candid touring and backstage footage from around the world, plus the never-before-seen music video for "Shovel Knockout" (from the Relentless Reckless Forever album). There are also detailed liner notes penned by the members of Children of Bodom themselves. For me, the cover versions that Children of Bodom do are always a highlight - and on this album we get two brand new covers. The two new cover songs are "I'm shipping up to Boston", originally by Dropkick Murphys, and "Jessie's girl", originally by Rick Springfield. The Dropkick Murphys cover is a less surprising choice than the Rick Springfield cover. Children of Bodom have done a great job on "I'm shipping up to Boston" - it's still clearly the same song but has more power than the original - a great choice and performed superbly. The cover of "Jessie's girl" sounds more radically different to the Rick Springfield original - hardly a surprise though since the original was a lightweight radio friendly song, and Children of Bodom just don't do lightweight - they've made it a hard and heavy song which still songs great. If you've only got one or two of the bands albums then this is a great addition to your collection. If however you already have all seven studio albums then it's a much harder decision. Completists will buy it, but personally I'd rather just get the two new tracks from itunes. "Holiday at Lake Bodom (15 Years of Wasted Youth)" will be released on 21st May 2012 via Spinefarm records.